Recharge Winners! And Happy Birthday, Dr. Seuss! 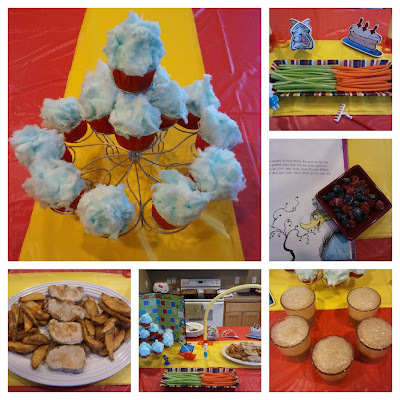 It was a big birthday weekend around our house - we always celebrate the birthday of Dr. Seuss with whatever wacky and wild menu I can come up. It's a ton of fun - we read our favorite Dr. Seuss books, watch the classic cartoon versions of The Cat in the Hat and The Sneetches and usually overdose on sugary treats. And now to announce the winners from the Recharge: Winter Writing Retreat! Winners were selected from random.org. Congratulations! Jennifer and Liz, please email crowriverwriter (at) gmail.com with your mailing address. Adrianne, send your first 30 to the same email address anytime after March 15 (I'm on a deadline for WFTS). Don't forget, if you'd like to include some of your work from the retreat in the "anthology" on Monday, March 18th (even if you didn't blog about it), please email me by the 16th. I won't be around much this week - WAITING FOR THE SUN is waiting for revisions, so I'm slipping back into my writing cave. Thanks once again to everyone who participated in the retreat last week! Those cupcakes are fantastic! Good luck with your edits. I'm sending an email w/ my addy in a few minutes - thanks! This was so much fun! I'm super excited about that nail polish. :) Good luck with your revisions! What a wonderful way to celebrate an author. What a fun birthday to celebrate! My son was born on Dr. Seuss's birthday and the hospital gave hardcover copies of CAT IN THE HAT to all babies born March 2nd. Those are really great cupcakes! Although I'm older now, I still love Dr. Seuss. A great way to mark the occasion and the kids look like they're having a blast! You have a fun house.